Smokehead — Quest Brands, Inc.
And if Smokehead is an assault on your senses, then High Voltage (58%) is an all-out attack. Louder, bolder and more intense. Alluringly left field, enticingly off kilter, Smokehead is custom built for outsiders who will happily walk across fields of burning peat to find something real, something authentic, something unusual. Something that fits them perfectly. Salt and seaweedy, peppery and peaty, smoky and sweet, Smokehead is definitely that. And defiantly not for everyone. 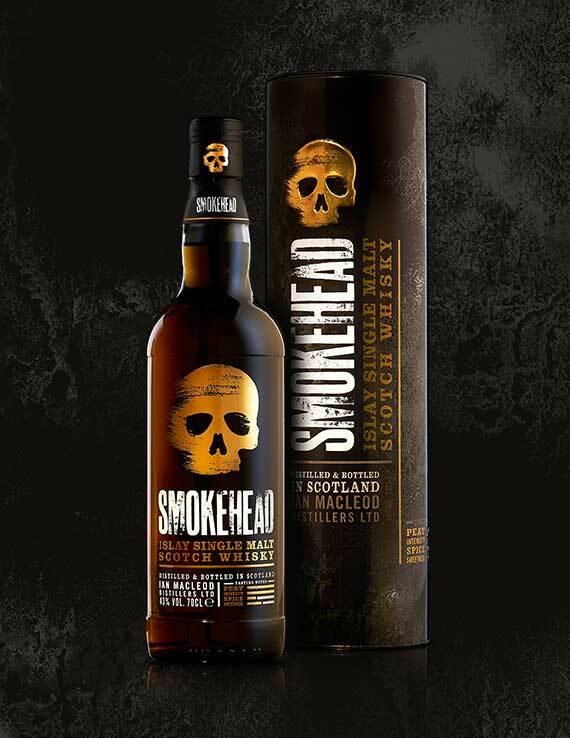 Smokehead Sherry Bomb is a peaty Islay single malt that has well and truly earned its name. Blasted by rich, sweet and spicy Spanish sherry casks, it has emerged as fiery, explosive, heavy hitting dram that has even turned our skull red. It might well be the exact highly unusual taste you’ve been waiting for. It might be a cannonball careering towards you that you’re keen to avoid. Either way, we’ve taken our ‘not for everyone’ mantra to a whole new level. If Smokehead is an assault on your senses, then High Voltage is an all-out attack. It’s breath-taking intensity is a red light for the faint of heart. And a thumbs up for those who don’t just enjoy the vigorous thump of the bass drum in their chest at a gig but savour but savor the ringing in their ears afterwards.